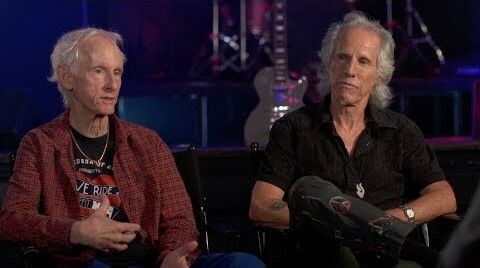 Robby Krieger and John Densmore of The Doors are the featured guests on the next edition of the AXS TV series The Big Interview With Dan Rather, and the network is streaming a preview of the episode ahead of its broadcast on Tuesday, March 20. The two surviving members of the band sat down with Rather at the Whisky A Go Go on Hollywood’s Sunset Strip to reminisce about their music, the sixties, activism, and the life and death of Jim Morrison. The Doors’ appearance on The Big Interview With Dan Rather will premiere on AXS TV on Tuesday, March 20 at 9 p.m. ET / 6 p.m PT. The Doors recently released “Live At The Isle Of Wight Festival 1970” on DVD+CD, Blu-ray+CD and digital video. Directed by Murray Lerner, the project captures the historic last concert ever filmed of the band; the original footage has been completely recut, remixed and meticulously restored via the latest technology, including color-correcting and enhanced audio in 5.1 Dolby Digital sound as mixed from the original multi-track material by longtime Doors engineer / mixer / co-producer Bruce Botnick.